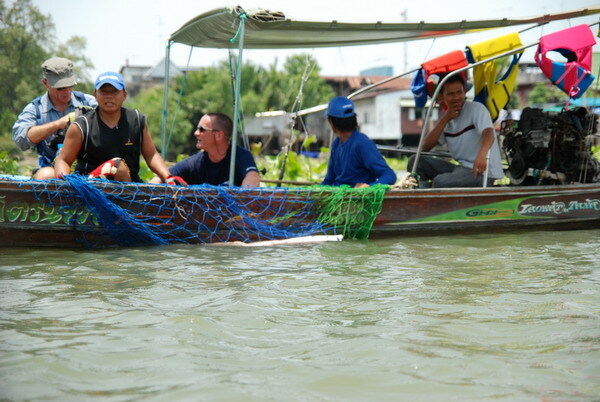 Another visit to the Maeklong River at Samut Songkran province saw Jeremy Wade in position in a previously productive area whilst filming River Monsters. Fishing with small Marbled Sand Goby livebaits the anglers positioned baits at various positions out in the flow of the main river. Corresponding the visit with the incoming tide the angler did nit have long to wait before a Giant freshwater stingray picked up one of the baits! After winding down into the fish with the 2 speed Okuma multiplier the rod hoped over as the battle began. Applying pressure from directly above saw the stingray soon brought off the bottom and being played out by Jeremy Wade deep beneath the boat. After clamping onto the bottom for several minutes the Giant freshwater stingray was prized once again from the riverbed and winched towards the surface. After playing the fish for several more minutes a Giant freshwater stingray slowly came into view from the murky depths. The fish was expertly netted on the first attempt and carefully secured to the side of the boat before being taken to the riverside. At the riverside the stingray was accurately weighed at a weight of 44.5kg and measured at a width of 123cm’s. Scientists from Chulalongkorn University conducted a series of scientific examinations on the small male stingray and the fish was released soon after an electronic tag was implanted into the rear section of the fish. The camera crew from Icon films carefully filmed events as Jeremy Wade assisted the scientists and Fishsiam team. 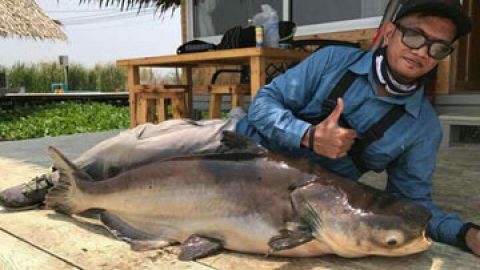 With still a few more hours fishing time left Jeremy Wade returned to the productive area and repositioned the rods. Almost one hour later a rod fished into the main part of the river was soon bending over as line was pulled slowly from the reel. Winding down into the fish saw it make a powerful run towards the main flow of the river causing the boat to be pulled round in a wide arch. Constant pressure on the fish saw it brought off the bottom several times only for it to dive back down to the riverbed each time. After fifteen minutes of further exertion the anglers succeeded in bringing the fish into open water where it was played out with relative ease. Moments later a large male surfaced next to the boat and was scooped up in the folds of the net. After transporting the fish to the riverside the Giant freshwater stingray was weighed at just over 60kg’s before the Chulalongkorn science team conducted further scientific studies. The Giant freshwater stingray was released back to the river marking an end to another successful days filming for River Monsters.